Since its appearance in 1997 2G has made a name for itself internationally as a quality magazine of enormous prestige. Its expert choice of published themes, rigorous editorial treatment, and careful and attractive graphic design are some of the basic ingredients that have contributed to 2G's international fame. 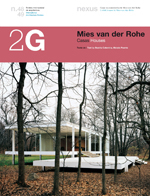 2G offers wide-ranging monographic issues devoted to the recent work of a major contemporary architect, and to particular aspects of the work of the great masters of modern architecture. Each issue is introduced by one or more texts by critics of international renown, who analyse and comment on the buildings making up the central section of the number.